Some of you may be wondering what Geocaching is, right? Don't worry. Geocaching is a game where you have to find hidden treasures outdoors. Those treasures need to be found with GPS devices, like an smartphone. This game was born in 2000 in the United States of America, thanks to a website were GPS coordinates were publsihed. Today, Geocaching has website and mobile app. 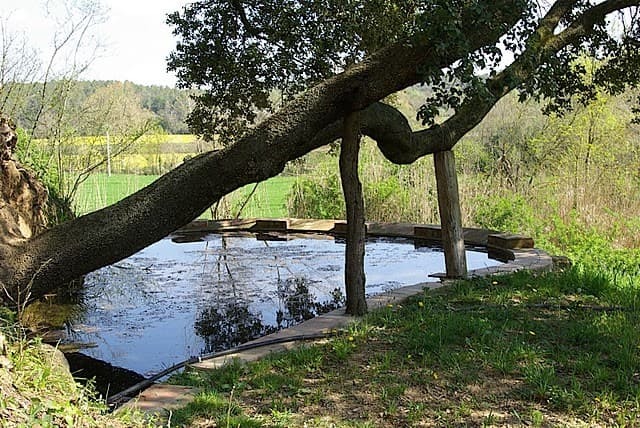 Between the regions of La Garrotxa, Alt Empordà and Pla de l'Estany you can find the country house of Biure's Castle (11th century) where, by walking, you can find the washing places of the house. A water stream where, not so long ago, women used to clean clothes. The washing places have been restored in order to keep the story of this beautiful place. Once you walk through the olive trees of the entry of Lledoners, we find windmill stones in the split. We have to go throught the right one, and once we pass by the solar plates (that are in our right side), we will find Can Ginestera (which is at the left side). We have to cross a tiny river, and we have to go up until we find the first split to the left. The washing places are by themselves a really beautiful site to discover, but we encourage you to find the treasure hidden some metres away.